PanARMENIAN.Net - PanARMENIAN.Net presents the path of the Armenian player from Pyunik to Manchester United. Henrikh was born on January 21, 1989 to the family of Hamlet Mkhitaryan, who played for Ararat and Valence, a French football club. In 1990, the family moved to France to join the father and returned to Yerevan after his death. 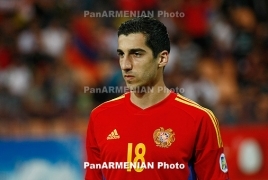 In Armenia, Henrikh entered Pyunik academy and at the age of 14 was sent to Barizlian club Sao Paulo for training. When he came back, he already knew Portuguese, English, Russian and French. Later, he learned Ukrainian and German. Mkhitaryan started his career in Pyunik, being one of the team leaders. He struck his first goal in September 2006 in a match against Shirak. In 2009, he was the top goalscorer of the Armenian championship and aroused the interest of Lokomotiv Moscow, Dynamo Kyiv, Boca Juniors (Argentina), Lyon and Lille (France). However, the young player chose Metalurh Donetsk. Mkhitaryan is the best goalscorer in the history of Armenian national team, where he debuted on January 14, 2007 in a match against Panama a week before turning 18. In 2009, 2011 and 2012, he was named Armenia’s best football player. During the Euro-2012 qualifiers he struck 6 goals, topping Group B goalscorers’ list, what helped Armenia keep the chance for play-off. On October 15, 2013, in a 2014 World Cup qualifier Mkhitaryan struck his 12th goal, becoming the best goalscorer in the history of Armenian national team. In March 2016, he replaced goalkeeper Roman Berezovsky as the national team captain. Unfortunately, Armenia failed the UEFA Euro 2016 qualifiers to bottom the group with 2 points after 8 matches. After the defeat, the team started preparing for the World Cup. Mkhitaryan debuted in a Metalurh match in Europa League on July 16, 2009, scoring a goal. Before the 2010/11 season, he was elected the captain. During a year in the club, he was recognized as the best novice, striking 17 goals in 46 matches. After such a successful beginning in the Ukrainian Premier League, Shakhtar Donetsk signed Mkhitaryan. In 2010, Shakhtar Donetsk paid $7,5 million for Mkhitaryan, signing a long-term contract. As a team member, the young Armenian scored 38 goals in 72 matches. In a match against Chornomorets Odesa, he struck a hat trick, thus ending the game 5-1 and gaining the title of top goalscorer of the Ukranian championship. On September 19, 2012, during a match against Danish FC Nordsjælland, Mkhitaryan became the first Armenian footballer to score a goal in Champions League. In 2012/2013 season, he set a new record in Ukrainian championship, striking 18 goals in the first round matches. He was recognized as the best player of the Ukrainian Premier League in 2012 and the most popular player of the International Federation of Football History & Statistics (IFFHS). In June 2013, Mkhitaryan violated the team rules, not appearing for a training in Austria. Media reports suggested that he is planning to transfer to another club. A number of foreign clubs showed interest in the Armenian footballer, including Liverpool, Manchester City, Chelsea, Tottenham, Juventus and Borussia Dortmund. Initially, Liverpool had the biggest chance to get Henrikh, however on July 8, 2013, Borussia announced the transfer costing €27.5 million, the most expensive in the club’s history. On September 4, 2013, Mkhitaryan scored his debut goals with a brace against Eintracht Frankfurt (1-2). During the German Super Cup, Mkhitaryan scored the first goal in the match against Bavaria to let his team win 2-0. Although Mkhitaryan showed worse results later, Borussia could push through to the Europa League. At the beginning of 2015/2016 manager Jurgen Klopp resigned to be replaced by Thomas Tuchel. Mkhitaryan starred with a hat trick in the second Europa League qualifier against Austrian FC Wolfsburg and scored a brace in a match against Borussia Mönchengladbach. He was recognized as the best assist maker, finishing the season with 11 goals and 15 assists. The Armenian midfielder was selected as Deutsche Welle Player of the Season. The Armenian won 26% of the votes, holding off competition from Bayer Leverkusen striker Javier Hernandez (21%) and Bayern Munich duo Thomas Müller and Robert Lewandowski (both 17%) to claim the honor. He was also named the best player of the season of the Bundesliga 2015-16, according to a poll conducted by German magazine, Kicker. In 2015-16, Mkhitaryan made 52 appearances, scoring 23 goals and making 32 assists. On June 2, 2016, Borussia Dortmund officially confirmed the transfer of Mkhitaryan to Manchester United for €42 million. The Armenian midfielder himself will receive an €8 million signing on bonus and €12.5 million salary per year. Mkhitaryan got the title of the most expensive footballer from the post-Soviet space, surpassing Andrey Shevchenko, whose move from Milan cost Chelsea €40 million. "Henrikh is a real team player with great skill, vision and also has a good eye for goal," Manchester United manager Jose Mourinho said. "I am delighted he has chosen to sign for United. I believe he will make an impact on the team very quickly as his style of play is suited to the Premier League. We are all looking forward to working with him." Mkhitaryan said he is "very proud" to sign for Manchester United, adding: "This move is a dream come true for me. "I am excited to play for a club with such an illustrious history and hope to be part of it for a long time. I thank the trust the club and Jose Mourinho have put in me. Finally, I believe playing for such a great club honors my father's memory, and the inspiration and drive he gave to me when I was young."